This description of the Book of Nahum is from Easton's Bible Dictionary. 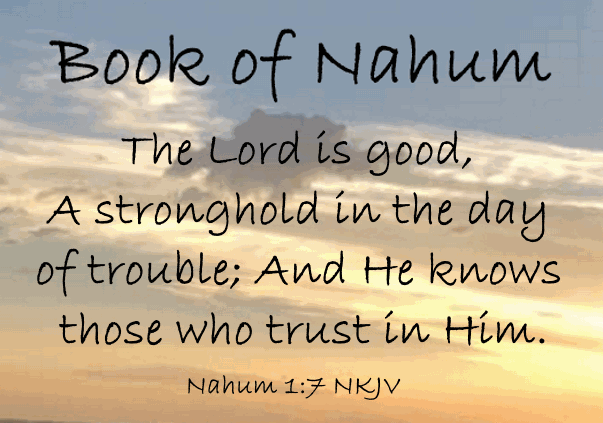 Nahum, Book of: Nahum prophesied, according to some, in the beginning of the reign of Ahaz (B.C. 743). Others, however, think that his prophecies are to be referred to the latter half of the reign of Hezekiah (about B.C. 709). This is the more probable opinion, internal evidences leading to that conclusion. Probably the book was written in Jerusalem (soon after B.C. 709), where he witnessed the invasion of Sennacherib and the destruction of his host (2 Kings 19:35). The subject of this prophecy is the approaching complete and final destruction of Nineveh, the capital of the great and at that time flourishing Assyrian empire. Assur-bani-pal was at the height of his glory. Nineveh was a city of vast extent, and was then the centre of the civilization and commerce of the world, a "bloody city all full of lies and robbery" (Nahum 3:1), for it had robbed and plundered all the neighbouring nations. It was strongly fortified on every side, bidding defiance to every enemy; yet it was to be utterly destroyed as a punishment for the great wickedness of its inhabitants.